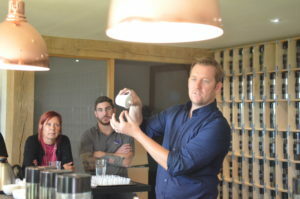 At Blends For Friends we have our own Master Tea Blender Alex Probyn and plenty of tea experts within the business that love talking tea and hosting tea tasting events and tea masterclasses. We host monthly public tea masterclasses, private tea tasting events and corporate tea masterclasses and we can design bespoke tea events for any size group. We are happy to host events at our beautiful premises in the Kent countryside or we can travel to you, in fact, Alex Probyn, our Master Tea Blender, has hosted tea tasting events in over 20 countries for groups of up to 500 people. With an unrivalled range of teas, herbs and spices to choose from, our tea tasting events are designed to be informative, interactive and above all, lots of fun for all those who participate. If you are looking to participate in one of our public, ticketed tea tasting events please find the details of upcoming events below. During our public tea tasting event afternoons, which run from 2pm – 5.30pm on Fridays throughout the year, guests will be greeted with a nice cup of tea (of course!) and will then take their seats in ‘The Blendatorium’ for an introduction to the history of tea and the process of manufacture before getting to slurp and sample 20 different teas, herbal infusions and quirky blends from around the world. The tea masterclass includes a tasty afternoon tea created in our own in-house café with tea-themed sweet treats. The afternoon concludes with the creation of your own bespoke tea blend using all the knowledge you will have gained during the course of the afternoon, plus a little help from us! Our public tea tasting events cost £75 per person and make a fabulous gift for you or your tea loving friends. If you would like to book one of our public events or would like to discuss a private or corporate bespoke tea tasting event at a location of your choice, then we would be delighted to help – please send us an email at tasting@blendsforfriends.com or call us on 01732 760808.